Bring the holidays to your Products. Ships flat, just pull the string and create your bow in a flash! 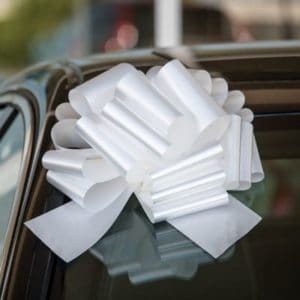 Conveniently ties to a suction cup for use on a vehicle windshield or use them to decorate the showroom, office cubicles or any large gift worthy of a beautiful bow! This bow has a 12 inch diameter with 8 inch long tails. Made from 4 inch wide shiny weather resistant material, these bows can be used indoors or outdoors. 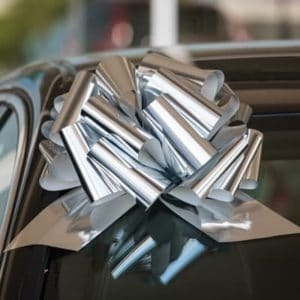 The size of this bow allows them to be used on the windshield to highlight a price, year or vehicle feature. Or use on anything that needs a big shiny bow! 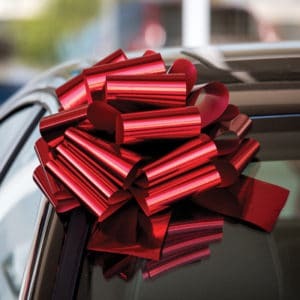 Call us at (877) 424-4433 for special orders or orders over 20 sets of two (40 bows). We only ship to the Continental United States. We DO NOT ship to Canada, Hawaii or Alaska.